Muzaffar Chisti provided opening remarks at a symposium held by MPI on Capitol Hill to commemorate the 50th anniversary of the Immigration and Nationality Act of 1965. The transcript and video of the event are available online. October 2015 marks the 50th anniversary of the seminal Immigration and Nationality Act of 1965. Signed into law at the foot of the Statue of Liberty by President Lyndon B. Johnson, the act ushered in far-reaching changes that continue to undergird the current immigration system, and set in motion powerful demographic forces that are still shaping the United States today and will in the decades ahead. The law, known as the Hart-Celler Act for its congressional sponsors, literally changed the face of America. It ended an immigration-admissions policy based on race and ethnicity, and gave rise to large-scale immigration, both legal and unauthorized. While the anniversary has provided an opportunity to reflect on the law’s historic significance, it also reminds us that the ’65 Act holds important lessons for policymaking today. The historic significance of the 1965 law was to repeal national-origins quotas, in place since the 1920s, which had ensured that immigration to the United States was primarily reserved for European immigrants. The 1921 national-origins quota law was enacted in a special congressional session after President Wilson’s pocket veto. Along with earlier and other contemporary statutory bars to immigration from Asian countries, the quotas were proposed at a time when eugenics theories were widely accepted. The quota for each country was set at 2 percent of the foreign-born population of that nationality as enumerated in the 1890 census. The formula was designed to favor Western and Northern European countries and drastically limit admission of immigrants from Asia, Africa, the Middle East, and Southern and Eastern Europe. In major revisions to U.S. immigration law in 1952, the national-origins system was retained, despite a strong veto message by President Truman. Building on a campaign promise by President Kennedy, and with a strong push by President Johnson amid the enactment of other major civil-rights legislation, the 1965 law abolished the national-origins quota system. It was replaced with a preference system based on immigrants’ family relationships with U.S. citizens or legal permanent residents and, to a lesser degree, their skills. The law placed an annual cap of 170,000 visas for immigrants from the Eastern Hemisphere, with no single country allowed more than 20,000 visas, and for the first time established a cap of 120,000 visas for immigrants from the Western Hemisphere. Three-fourths of admissions were reserved for those arriving in family categories. Immediate relatives (spouses, minor children, and parents of adult U.S. citizens) were exempt from the caps; 24 percent of family visas were assigned to siblings of U.S. citizens. In 1976, the 20,000 per county limit was applied to the Western Hemisphere. And in 1978, a worldwide immigrant visa quota was set at 290,000. Though ratified half a century ago, the Hart-Celler framework still defines today’s legal immigration system. Under current policy, there are five family-based admissions categories, ranked in preference based on the family relationship, and capped at 480,000 visas (again, exempting immediate relatives of U.S. citizens), and five employment-based categories capped at 140,000 visas. Smaller numbers are admitted through refugee protection channels and the Diversity Visa Lottery—a program designed to bring immigrants from countries that are underrepresented in U.S. immigration streams, partly as a consequence of the 1965 Act. Though Congress passed the Immigration Act of 1990 to admit a greater share of highly skilled and educated immigrants through employment channels, family-based immigrants continue to comprise two-thirds of legal immigration, while about 15 percent of immigrants become permanent residents through their employers. Much of the sweeping impact of the 1965 Immigration and Nationality Act was the result of unintended consequences. "The bill that we sign today is not a revolutionary bill," President Johnson said during the signing ceremony. “It does not affect the lives of millions. It will not reshape the structure of our daily lives, or really add importantly to either our wealth or our power.” Senator Ted Kennedy (D-MA), the bill’s floor manager, stated: "It will not upset the ethnic mix of our society." Even advocacy groups who had favored the national-origins quotas became supporters, predicting little change to the profile of immigration streams. Despite these predictions, the measure had a profound effect on the flow of immigrants to the United States, and in only a matter of years began to transform the U.S. demographic profile. The number of new lawful permanent residents (or green-card holders) rose from 297,000 in 1965 to an average of about 1 million each year since the mid-2000s (see Figure 1). Accordingly, the foreign-born population has risen from 9.6 million in 1965 to a record high of 45 million in 2015 as estimated by a new study from the Pew Research Center Hispanic Trends Project. Immigrants accounted for just 5 percent of the U.S. population in 1965 and now comprise 14 percent. Source: Migration Policy Institute (MPI), “Legal Immigration to the United States, 1820-Present,” available online. A second unintended consequence of the law stemmed largely from a political compromise clearly intended to have the opposite effect. The original bill provided a preference for immigrants with needed skills and education. But a group of influential congressmen (conservatives allied with the Democratic chairman of the House immigration subcommittee) won a last-minute concession to prioritize admission of immigrants with family members already in the United States, believing it would better preserve the country’s predominantly Anglo-Saxon, European base. In the following years, however, demand from Europeans to immigrate to the United States fell flat while interest from non-European countries—many emerging from the end of colonial rule—began to grow. New and well-educated immigrants from diverse countries in Asia and Latin America established themselves in the United States and became the foothold for subsequent immigration by their family networks. Source: MPI, “Regions of Birth for Immigrants in the United States, 1960-Present,” available online. Compared to almost entirely European immigration under the national-origins system, flows since 1965 have been more than half Latin American and one-quarter Asian. The largest share of today’s immigrant population, about 11.6 million, is from Mexico. Together with India, the Philippines, China, Vietnam, El Salvador, Cuba, South Korea, the Dominican Republic, and Guatemala, these ten countries account for nearly 60 percent of the current immigrant population. Source: MPI, “Largest U.S. Immigrant Groups over Time, 1960-Present,” available online. In turn, the law dramatically altered the racial and ethnic makeup of the United States. In 1965, whites of European descent comprised 84 percent of the U.S. population, while Hispanics accounted for 4 percent and Asians for less than 1 percent. Fifty years on, 62 percent of the U.S. population is white, 18 percent is Hispanic, and 6 percent is Asian. By 2065, just 46 percent of the U.S. population will be white, the Hispanic share will rise to 24 percent, Asians will comprise 14 percent—and the country will be home to 78 million foreign born, according to Pew projections. The 1965 Act also inadvertently laid the foundation for the steep rise in illegal immigration since the 1970s. In a parallel development whose impact was not recognized at the time, Congress in 1964 terminated the Bracero program, which since 1942 had been used to recruit temporary agricultural workers from Mexico to fill World War II farm-labor shortages in the United States. In total, 4.6 million Mexican guestworkers were admitted, peaking at 445,000 in 1956. When the guestworker program ended, many former Bracero workers continued crossing the border to fill the same jobs, but now illegally. The combination of the end of the Bracero program and limits on legal immigration from the Western Hemisphere combined to fuel the rise of illegal immigration. Introduced in January 1965 and signed into law on October 3, the Hart-Celler Act took only nine months to enact. Its swift passage through the 89th Congress raises the question of why today’s political leaders have failed for more than a decade to pass substantive immigration legislation. First, passage of the law was truly bipartisan, despite Democratic control of the White House, Senate, and House. In the Senate, the bill was approved by a vote of 76 to 18, with support from 52 Democrats and 24 Republicans. The House passed the bill 320 to 70; 202 Democrats and 117 Republicans supported it, while 60 Democrats and ten Republicans voted against it. Not only did the bill win support from the majorities of both parties in the House and Senate, in each more Democrats opposed the bill than Republicans. Second, lawmakers approved the measure without significant floor debate—deferring to the expertise of the Judiciary committees and their immigration subcommittees to craft the proposal. 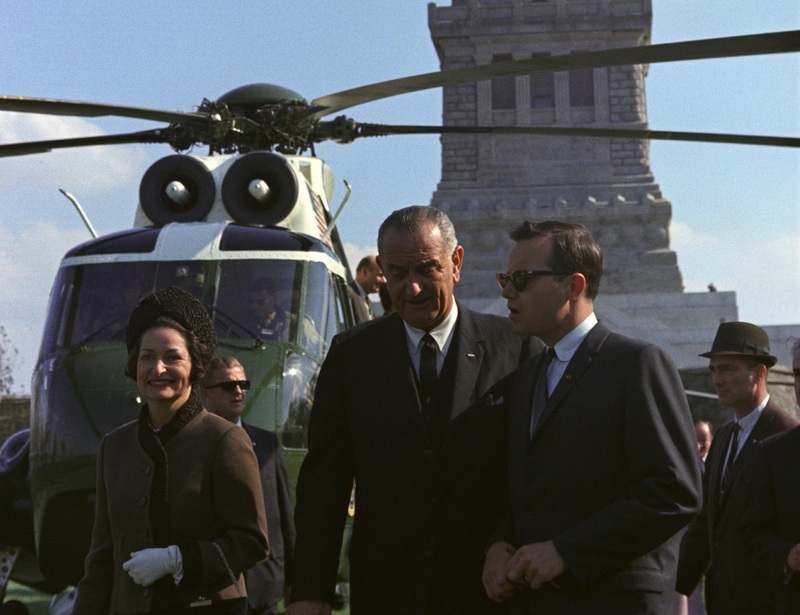 Lastly, President Johnson focused his attention not on policy details or advancing the White House’s immigration agenda, but on the process of moving the bill forward through Congress. In today’s hostile political climate, congressional gridlock, and polarized, high-stakes immigration debate, lawmakers could learn from the process that led to the law’s swift passage. The 1965 Act: A Success or Failure? Opinions differ on whether the 1965 Act helped or harmed the country. The law’s proponents see it as a historic success and assert that the estimated 59 million immigrants who have come to the United States since its passage have made the country younger, infused it with diversity and talent, and generated prosperity and economic growth. Critics contend that high admission levels of diverse groups of immigrants have created more competition for low-skilled U.S. workers, and shattered the country’s cultural homogeneity. Despite such misgivings, a recent major study by the National Academies of Sciences, Engineering, and Medicine suggests that post-1965 Act immigrants and their children—estimated to comprise one in four people in the United States—are successfully integrating into U.S. society. The study finds that immigrant integration increases over time and successive generations achieve strong progress in key indicators including education, earnings, language proficiency, and occupational distribution. At the same time, immigrants and their descendants as a whole still lag behind the native-born population on these indicators. How well post-1965 Act immigrants have integrated has varied substantially, depending on their legal status, social class, educational background, and the geographic area where they settle, the study also found. Profiles of diaspora groups (comprised of immigrants and their U.S.-born descendants) from countries that have dominated post-1965 immigration flows show that many have surpassed median U.S. educational attainment levels, household incomes, and workforce participation rates. The Indian diaspora, for example—numbering 3.8 million—is significantly higher educated, more likely to be employed, and has a higher household income compared to the U.S. population as a whole. The Filipino, Bangladeshi, Pakistani, Egyptian, Kenyan, and Nigerian diasporas tell similar stories, while the diasporas of other countries, such as Ghana, Morocco, Ethiopia, and Colombia are generally on par with medians for the U.S. born on most indicators. Further, the educational levels of newly arrived immigrants have been consistently improving since the 1970s, according to the Pew Hispanic Trends study. In 2013, 41 percent of recently arrived immigrants were college graduates compared to 20 percent in 1970. In comparison, 30 percent of the native-born population had college degrees in 2013 vs. 11 percent in 1970. While the 1965 law has empowered many diverse immigrants and their families to build new and prosperous lives in the United States, its unintended consequences have clearly hindered integration for others—particularly diaspora groups whose members are more likely to lack legal status. Mexican immigrants and their descendants (an estimated 34.8 million) are far more socioeconomically disadvantaged than other diaspora groups, and have below-average educational attainment and household incomes. The Salvadoran and Haitian diasporas have a similar profile. At heart, the current U.S. immigration debate is an unresolved cultural conversation about the nation’s identity. As the congressional policymaking process remains stalled, many of the dynamics established by the 1965 Immigration and Nationality Act—for better or for worse—are likely to persist. Until there are consequential changes to the immigration system, now a half-century old, the 1965 Act will continue to shape the changing face of America. Meanwhile, on September 18, the Obama administration appealed an August federal court ruling in Flores v. Lynch that ordered the immediate release of families from immigration detention. The ruling found that the Department of Homeland Security (DHS) had breached a long-standing court settlement that requires immigrant children be held only in facilities licensed to care for children, and gave authorities until October 23 to comply. Obama Administration Increases Aid and Admissions for Syrian Refugees. On September 21, the U.S. Agency for International Development (USAID) announced that the United States would donate an additional $419 million in humanitarian and refugee aid to those affected by the four and a half year conflict in Syria. In total, the United States has donated more than $4.5 billion to Syria relief efforts since 2012. Furthermore, the White House increased the number of Syrian refugees to be resettled in the United States from 2,000 in FY 2015 to 10,000 in FY 2016, which began on October 1. The Obama administration also raised the worldwide refugee admissions ceiling from 70,000 in FY 2015 to 85,000 in FY 2016, and has said the quota will be increased to 100,000 in FY 2017. Many observers argue that although the proposed increases are significant compared to last year’s admissions, they do not meet the global demand for resettlement of refugees fleeing war in Syria and other countries in the Middle East. Obama Administration Revises Proposed Changes to Visa Bulletin. On September 25, the State Department and U.S. Citizenship and Immigration Services (USCIS) announced a reversal to the Visa Bulletin changes proposed earlier in the month. The monthly Visa Bulletin provides information on when statutorily limited visas are available to be issued to prospective immigrants based on their individual priority dates (the filing date of their approved immigrant visa petitions). The proposed changes were part of the president’s November 2014 executive actions on immigration, and would have allowed certain individuals in the immigrant-visa backlog to submit their permanent residence applications before their priority dates. In anticipation of these changes, it is estimated more than 20,000 immigrants had prepared their applications for filing, which would have enabled the primary applicants and derivative family members to obtain employment authorization and travel documents. The government since said the bulletin was “adjusted to better reflect a timeframe justifying immediate action in the application process.” In response to the sudden reversal, a group of high-skilled immigrants filed a federal lawsuit in Seattle claiming damages that arose from expenses related to their legal fees or medical exams. Cuban Arrivals Rise at Texas Ports of Entry. Between October 2014 and June 2015, approximately 18,520 Cubans arrived at ports of entry in South Texas seeking admission into the United States. If the trend held, the Texas border region would have seen an estimated 24,700 Cuban migrants arrive at land ports between Del Rio and Brownsville by the end of FY 2015, representing a 60 percent increase from FY 2014. The influx is presumed to be in response to a recent decision by Cuba and the United States to normalize diplomatic relations for the first time since 1959. The change has raised concerns among Cubans that their special treatment under United States immigration law could be terminated in the normalization process. The special status of Cubans dates back to the Cuban Adjustment Act of 1966, which allows Cubans arriving in the United States via land ports to be admitted and be eligible to apply for lawful permanent residence after one year in the United States. No other country’s nationals are afforded similar treatment by U.S. law. Some Immigrants with Mental Disabilities May Contest Removal under New Court Settlement. The American Civil Liberties Union (ACLU) and DHS on September 25 finalized a federal district court settlement allowing eligible immigrants with serious mental illnesses who were ordered deported to reopen their cases with the possibility of returning to the United States. The settlement applies to noncitizens with mental disabilities who were not given a legitimate competency determination and were deported after representing themselves without counsel in immigration court. Under a pair of court orders issued in 2013 and 2014, immigrants with serious mental disabilities facing deportation have a right to legal representation if they are determined not competent to represent themselves, and the government is required to provide such determinations. The settlement applies to noncitizens detained in Arizona, California, and Washington after November 21, 2011. Mental disabilities covered in the settlement include psychosis, bipolar disorder, schizophrenia, and major depressive disorder. Obama Administration Launches Naturalization Initiative. On September 17, the White House launched a public awareness campaign to encourage eligible legal permanent residents (LPRs) to apply for U.S. citizenship. Of the 13.3 million LPRs in the United States, 8.8 million are eligible to naturalize, according to recent DHS estimates. During the campaign’s first week, a variety of businesses and nonprofits hosted more than 70 citizenship outreach events, while the federal government held 200 naturalization ceremonies for more than 36,000 new citizens across the United States. Additionally, USCIS will post online U.S. civics and history practice tests for the naturalization exam that permanent residents are required to pass to become citizens. USCIS will also begin allowing credit card payments of the $680 naturalization fee. The initiative is one component of a series of executive actions on immigration announced by President Obama in November 2014. North Carolina Legislature Passes E-Verify, Sanctuary Cities, and ID law. On September 29, North Carolina’s General Assembly passed the Protect North Carolina Workers Act. The bill prohibits use of identification issued by municipalities, counties, or diplomatic consuls to establish eligibility for state benefits. It also places a ban on “sanctuary city” policies allowing local governments to limit cooperation between state and local law enforcement agencies and Immigration and Customs Enforcement (ICE) in the enforcement of immigration laws. The proposed bill also requires that state and local government agencies only hire contractors who use the E-Verify system to check their workers’ immigration statuses. Having passed both chambers of the state legislature, the bill has been sent for Governor Patrick McCrory’s signature. The governor has not indicated whether he will sign it into law. Los Angeles County Unveils New PEP Policy. On September 22, Los Angeles County Sheriff Jim McDonnell announced a new policy outlining how his agency will cooperate with ICE. Under the guidelines, LA County will only comply with a detainer—a request from ICE to hold a person beyond their scheduled release for transfer into ICE custody—if it meets ICE’s detainer requirements and is not protected by the California Trust Act. The California Trust Act, enacted in 2013, bars law enforcement agencies in the state from honoring detainers, but does not protect those who have been convicted of serious crimes such as burglary, assault, sexual abuse, or felony DUI. ICE agents will also be allowed access to inmates in LA County jails being processed for release, as well as interview inmates who have committed serious crimes as defined by the Trust Act and have a high likelihood of being in the United States without authorization. The new policy is in response to a federal initiative called the Priority Enforcement Program (PEP), which allows ICE agents to match the fingerprints of inmates in local jails against DHS immigration databases to determine their immigration status. PEP replaced the controversial Secure Communities program in July.